Oltremare is a theme park in Riccione, a few metres from the A14 motorway exit. 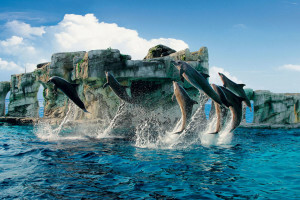 Inside the park there is the largest Dolphinarium in Europe with 3,000 square meters and many dolphins who perform two daily shows. The Park offers 24,000 m² of exhibition area and 77,000 m ² of green spaces that include the delta of a river inhabited by fish and birds of various types, as well as a complete animal farm that hosts a show particularly impressive. 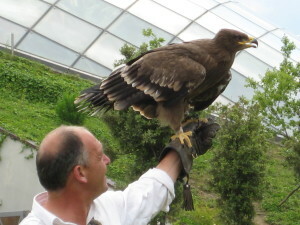 Flight of birds of prey is a spectacle not to be missed: daily professional falconers reveal the peculiarities of the various species of birds of prey that live in the Park and explain how they live and how they hunt, flying animals among the visitors who flock to the arena dedicated to them. In a striking structure in the shape of a geode is a unique attraction and charming: Hippocampus, a collection of seahorses from all parts of the world. Every day there are planned numerous shows of various kinds, to learn while having fun as live animals and plants from all over the world! Hotel Cesare is a convenient starting point to reach overseas, since the exit of the A14 motorway is located a few kilometers from the hotel it only takes a few minutes to get to the Park.